The pure, simple, unadorned word challah means “a loaf of bread.” However, in halachic terms the word challah has a very specific definition, and colloquially it came to mean a certain type of bread thousands of years later. The halachic definition of challah is a reference to Positive Mitzvah #133. 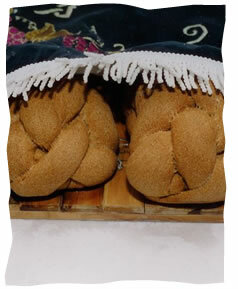 It entails separating a section of dough from your kneading and giving it to a kohen. This piece of dough is called “challah.” Any dough which is made of wheat, barley, spelt, oat or rye is obligated in this mitzvah. The kohen and his family would eat the challah while in a state of ritual purity. The rabbis decided that a home baker should give 1/24th of the dough to the kohen, while a commercial baker has to donate 1/48th of his dough. Biblically speaking, the mitzvah of challah is observed only in the Land of Israel. Furthermore, according to most halachic authorities, the mitzvah of challah was a requirement only in the times of the Temple. Today, no Temple, no challah. But the rabbis reinstituted the practice of challah—even outside the Land of Israel—to commemorate this special mitzvah. However, since today we are all considered ritually impure, the kohen cannot eat the challah. Instead, Jewish women through the centuries knead homemade dough, and then separate a piece of the dough and burn it. All kosher bakeries do the same—they separate a piece of dough from each batch, and throw it on the floor of the oven. Today only a small piece of dough is separated for challah: since it isn’t eaten, it would be wasteful to separate 1/24th or 1/48th of the dough. Baruch attah Ado-noy Elo-hei-nu melech ha-olam asher kid-e-sha-nu b’mitz-vo-tav v’tzi-vanu le-haf-rish challah. Eventually, the soft, sweet bread loaves customarily eaten by the Shabbat meals became known as challah (not “hally,” as is the popular mispronunciation). The content on this page is provided by AskMoses.com, and is copyrighted by the author, publisher, and/or AskMoses.com. You are welcome to distribute it further, provided you do not revise any part of it and you include this statement, credit the author and/or publisher, and include a link to www.AskMoses.com. Why lightly run the knife over challah? My Doctor Ordered Me Off Challah! challah As I understood the article, please correct me if I am mistaken, there is currently no "requirement" (i.e., positive mitzvah, commandment or otherwise,) to eat challah. Is that correct ? challah it is possible that you need to adjst the flour amounts due to the altitude of the place you live in...it's always best to put less flour in and slowly add as needed. Here's a recipe that's easy and has only one egg. You can omit the yolk if you want. challah thank you for everything i've learn too much from your site and i'm always trying to cook according to the ingredients mentionned infortunately whenever i cook challah i've never succed in it . it is always dry and stong like a rock , the pasta never be smmoth please give me ideas to make a smooth and lovely challah.